Stretching across Taungthaman Lake in Myanmar, the U Bein Bridge might look like just another rickety wooden crossing (which it is), but this historic span is actually made of the remains of a royal palace. Construction on the wooden bridge was completed in 1851 after three years. The bridge was built at a slight curve, and is supported by over a thousand wooden pillars that were hammered into the bottom of the shallow lake. The planks of teak that make up the surface of the bridge were taken from the old royal palace of Inwa, a former Burmese capital, that had been razed a number of times. The resulting bridge might not look very royal, but its history certainly is. Reaching three-quarters of a mile in length, the ramshackle span is surprisingly long for a wooden bridge with no rails, but it cuts a striking figure. The bridge has become one of the region’s most popular tourist attractions and most photographed features. It is especially striking in the evening when the colors of the sunset paint the scene in natural color. This of course means that the bridge becomes more crowded during those times. All the attention has taken its toll on the span. Some of the pillars have been replaced with concrete, and many of the original planks will need to be replaced or refurbished, lest they come off completely. 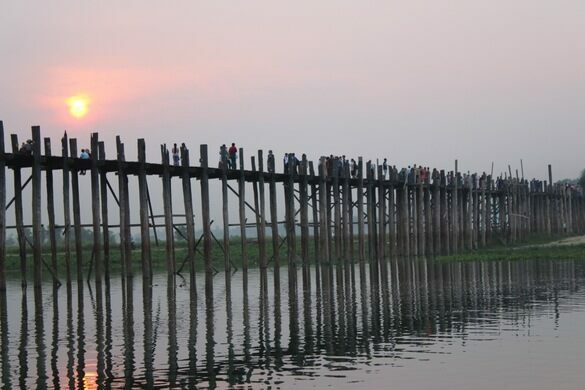 Nonetheless, the bridge is still a beautiful and popular place to capture the beauty of Myanmar. These serpents are considered holy and pampered accordingly. A grand imperial capital left to fall into magnificent ruin. The world's first and only three-segment bascule bridge folds up into the shape of a capital "N" to let boat traffic through. An unusually designed bridge from the 1920s was built to withstand the tides and winds of Maine.